Judging from photos taken in recent days on the set of the Whitey Bulger movie “Black Mass,” director Scott Cooper isn’t skimping on violence. This week, Cooper re-created the 1982 murder of Brian Halloran, who was killed by Bulger as he left the Topside Café with Michael Donahue. 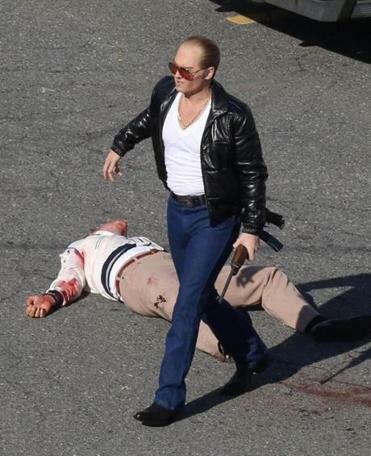 In the scene, which was shot in Lynn because the gentrification of the South Boston waterfront has rendered the place virtually unrecognizable, Johnny Depp, who plays Bulger, is seen with a rifle as he stalks past the bodies of Halloran and Donahue. Halloran, you’ll recall, was murdered because he’d implicated the mob boss in the death of Oklahoma business tycoon Roger Wheeler.